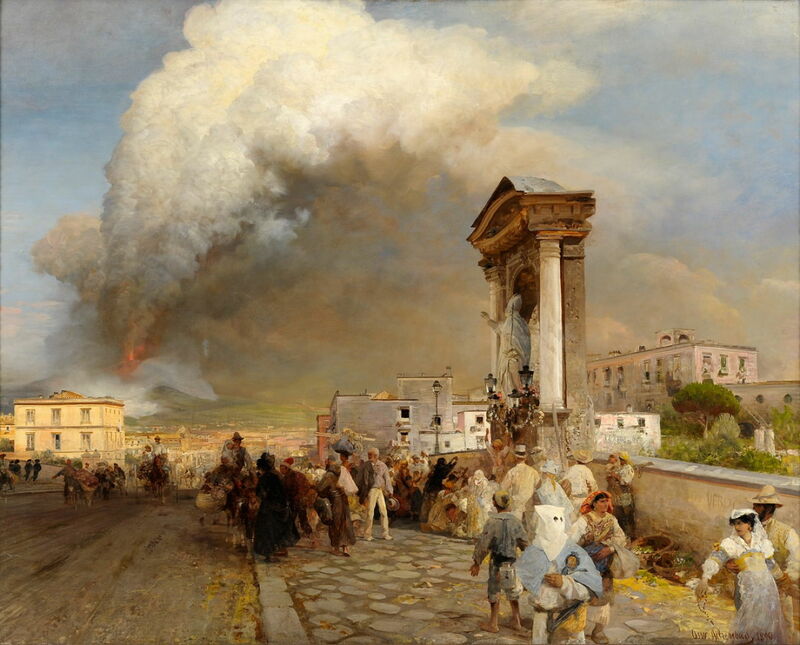 Oswald Achenbach (1827–1905), Naples, Eruption of Vesuvius 1872 (1890), oil on canvas, 124 × 150 cm, location not known. Wikimedia Commons. By 1800, paintings and their reproductions showing spectacular eruptions of Mount Vesuvius had become popular, and the Bay of Naples had often attracted artists who were visiting Italy. 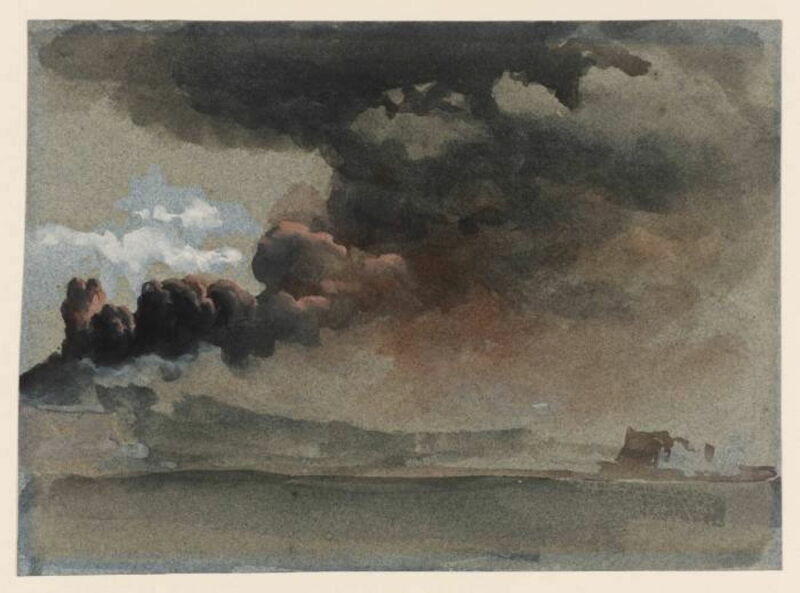 Joseph Mallord William Turner (1775–1851), Vesuvius in Eruption (1817-20), watercolour, 28.6 x 39.7, Yale Center for British Art, New Haven, CT. Wikimedia Commons. JMW Turner travelled extensively in Europe, and made his first proper tour of Italy in 1819-20. When he visited Naples, he was fortunate enough to see Mount Vesuvius during an active period, which culminated in its eruption on 1 June. He painted his watercolour of Vesuvius in Eruption at about that time, following the apocalyptic approach popular in the previous century. He has populated the shore of the bay quite densely, and although there is a crescent moon at the left edge of the painting, he did not develop any significant area in more serene mood and colours. Instead, he has filled it with shock and awe. Camillo De Vito (active 1794-1845), Eruption of Vesuvius by Night, 21 February 1820 (c 1820), gouache, 43 x 66 cm, location not known. Wikimedia Commons. Camillo De Vito, whose early painting showed such promise, seems to have caught an earlier phase during the eruptions in the same year. 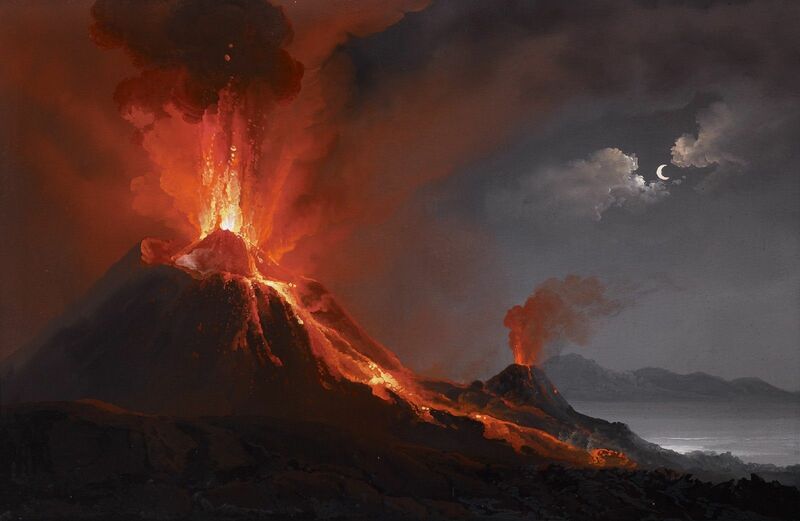 Most importantly, though, he has composed his Eruption of Vesuvius by Night, 21 February 1820 (c 1820) to great effect. 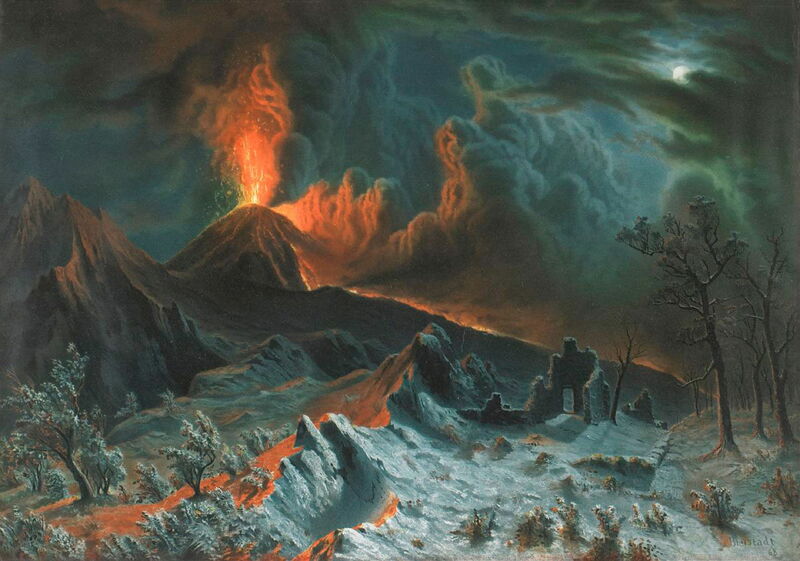 The contrast between the violence of the eruption and its reds and yellows at the left, and the distant serenity of the moonlit coast at the right is stark, and makes this mature version one of the finest views of the volcano. 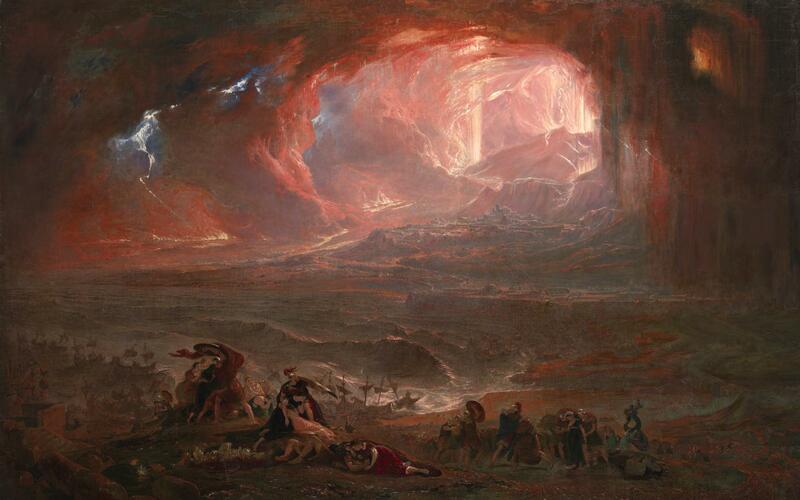 Turner was not the only foreign artist to visit and view Vesuvius in 1820. 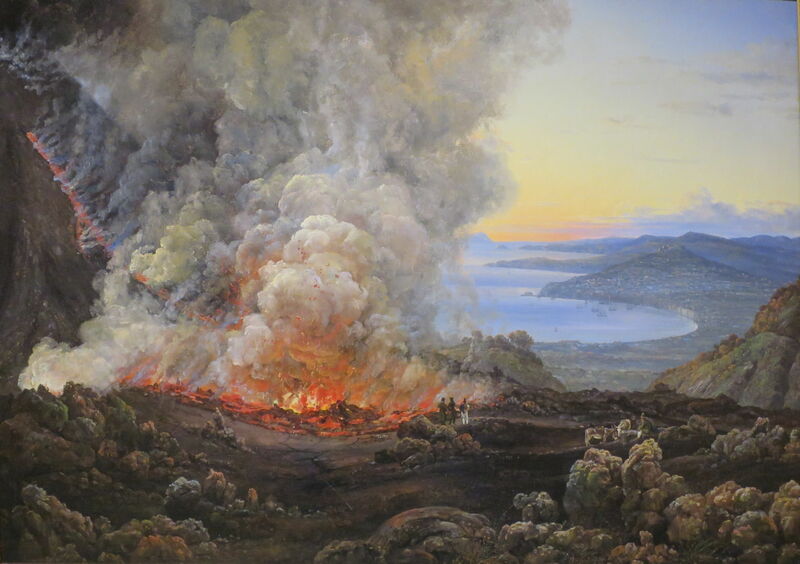 JC Dahl had been invited to join Prince Christian Frederik near Naples that year, and when he was there seems to have been as impressed with the eruptions as Joseph Wright of Derby had been in the late eighteenth century. 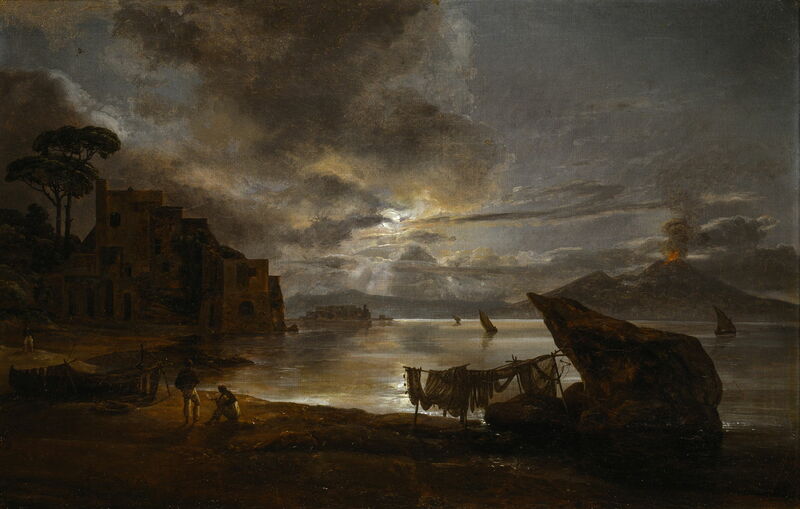 Johan Christian Dahl (1788–1857), The Bay of Naples by Moonlight (1821), oil on canvas, 49.7 × 68 cm, Thorvaldsens Museum, Copenhagen, Denmark. Wikimedia Commons. In The Bay of Naples by Moonlight, painted the following year, he has used the warm red light from a more modest eruption to provide colour contrast, and put the fine detail of fishing nets in the foreground. Johan Christian Dahl (1788–1857), Vesuvius in Eruption (1821), oil on canvas, 61 × 87.5 cm, Bergen kunstmuseum (Kunstmuseene i Bergen), Bergen, Norway. Wikimedia Commons. Dahl also travelled up to view lava flows on the slopes of the volcano, where he made sketches which he later developed into Vesuvius in Eruption (1821). This reversed view across the Bay of Naples was timed at dusk, with the sky to the west echoing more peacefully the reds and yellows of the molten rock in the foreground. 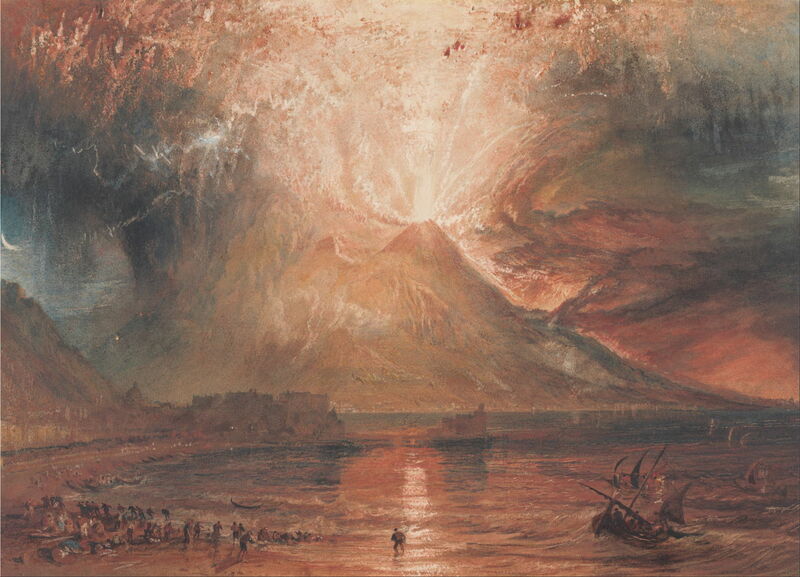 Dahl painted several further works showing Vesuvius, although he does not appear to have become as obsessed as Wright did. The eighteenth century saw renewed interest in the remains of the Roman towns of Pompeii and Herculaneum, which had been buried in lava, ash, and rock in 79 CE. Their sites had been abandoned by the Romans, and were not rediscovered until 1599. By the early nineteenth century, their story had become popular, and had started to inspire artists to show that most famous eruption of Vesuvius. As far as I can tell, John Martin never visited Italy, let alone witnessed Vesuvius erupting, but painted a series of very large works of apocalyptic visions, among them The Destruction of Pompei and Herculaneum in 1822. This is a Romantic and highly wrought depiction of the eruption of Mount Vesuvius which occurred on 24 August 79 CE, and which overwhelmed and killed most of the population of Pompeii and neighbouring towns. Martin was careful, though, to base this imaginative view on local geography. It is seen from the town of Stabiae, some distance away on the shore of the Bay of Naples. Herculaneum, in the left distance, has already been swallowed up by lava flows, whose flames and smoke rise above its site. Pompeii, shown in full view at the foot of the volcano, is still seen clearly, with its circular theatre and basilica. In the foreground are some of the survivors who have fled in the vessels being tossed around in huge waves below. This painting was first shown to the public in London in 1822, where it was part of a programme of entertainments which mixed art with spectacle, and was considered to be another step in Martin’s progress away from fine art to sensationalist images. The painting was originally commissioned by Richard Greville, and in 1867 was purchased by the National Gallery in London. Later transferred to the Tate, it was in storage in the gallery’s basement when that was badly flooded in 1928. Initially written off as damaged beyond repair, it was eventually painstakingly restored in 2011. Karl Bryullov (1799–1852), The Last Days of Pompeii (1830-33), oil on canvas, 456.5 x 651 cm, The State Russian Museum, St. Petersburg, Russia. Wikimedia Commons. Karl Pavlovich Bryullov visited Pompeii in 1828, when he was living in Rome, painting portraits and genre works. 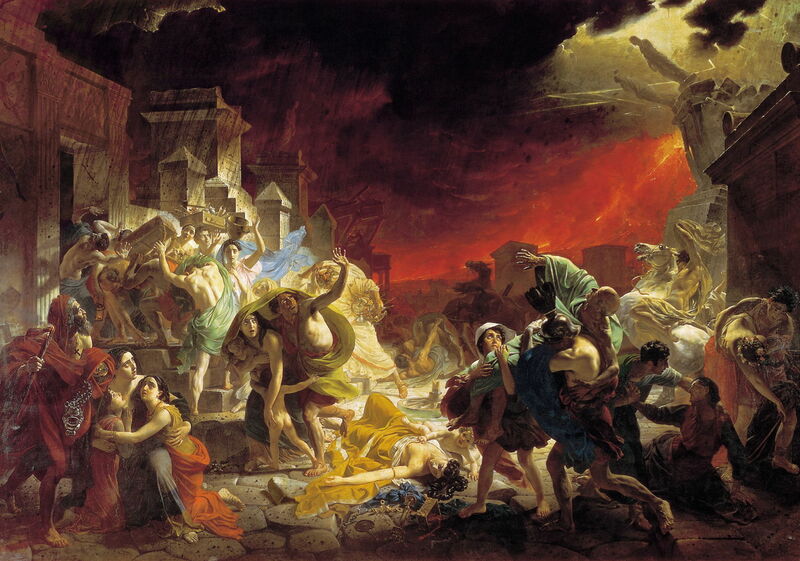 Some time between 1830 and 1833, he painted The Last Days of Pompeii, with its closer focus on the chaos, destruction, and death among the people in the streets of the town. To avoid overwhelming the viewer with the spectacle, he has carefully hidden the volcano behind collapsing buildings at the right. As new artistic movements and styles started to sweep Europe in the nineteenth century, many painters avoided spectacular depictions of the eruptions of Vesuvius, but showed it as a more integrated feature within the coast of the Bay of Naples. Clarkson Frederick Stanfield (1793-1867), An Eruption of Mount Vesuvius 1839 (1839), further details not known. Wikimedia Commons. Among those was the British landscape and marine artist Clarkson Frederick Stanfield, whose watercolour sketch of An Eruption of Mount Vesuvius 1839 must have been painted in front of the motif in early January of that year, when Vesuvius was active again. Albert Bierstadt (1830–1902), Mount Vesuvius at Midnight (1869), chromolithograph by J Jehenne of lost painting, 43.2 × 61 cm, Birmingham Museum of Art, Birmingham, AL. Wikimedia Commons. After Albert Bierstadt showed two of his landscape paintings in a private audience with Queen Victoria in 1867, he travelled in Europe for two years, reaching Naples in time to see an eruption, which he painted. Sadly his original has been lost since, but this chromolithograph of it survives, showing Mount Vesuvius at Midnight (1869). Bierstadt opts for a more traditional and Romantic view, but does use the device of the moon, with the ghostly remains of buried trees and ruins in the foreground. It is not clear when Bierstadt saw this eruption, though: his work is claimed to show an eruption in January 1868, but the significant activity that year was in the second half of November. Oswald Achenbach (1827–1905), The Bay of Naples with a View of Vesuvius (date not known), oil on canvas, 66 x 94 cm, location not known. Wikimedia Commons. Oswald Achenbach, the great German landscape artist, had visited Italy on many occasions during his career, even painting on the island of Capri. After he resigned from the post of Professor at the Kunstakademie Düsseldorf in 1872, he returned to Italy, and most probably painted The Bay of Naples with a View of Vesuvius during or after the eruption of late April. Unfortunately the date has been largely cropped off this image. He has adopted the popular viewpoint across the Bay of Naples, which allows him to make comparison between the volcano, in the centre, and the early morning sun, at the left. Vesuvius is now being better-integrated into its environment, and its effects on the atmosphere are more apparent. He must also have made sketches for this view of Naples, Eruption of Vesuvius 1872 which he didn’t complete and date until 1890. This is one of the most complex and sophisticated paintings of Vesuvius, which combines an apparently unexaggerated and realistic view of the volcano itself, and the local population reacting less wildly to its threat. This invites comparison with the more imminent catastrophe which faced the Pompeiians in their day. Charles Caryl Coleman (1840–1928), A Shower of Ashes Upon Ottaviano (1906), pastel on gray-blue laid paper mounted on board, 26.8 × 21.4 cm, Brooklyn Museum, New York, NY. Wikimedia Commons. By the twentieth century, Vesuvius had faded from the forefront of landscape painting, its eruptions largely being captured in photographs. In his later years, the American landscape artist Charles Caryl Coleman lived in Rose O’Neil’s house, Villa Narcissus, on Capri. 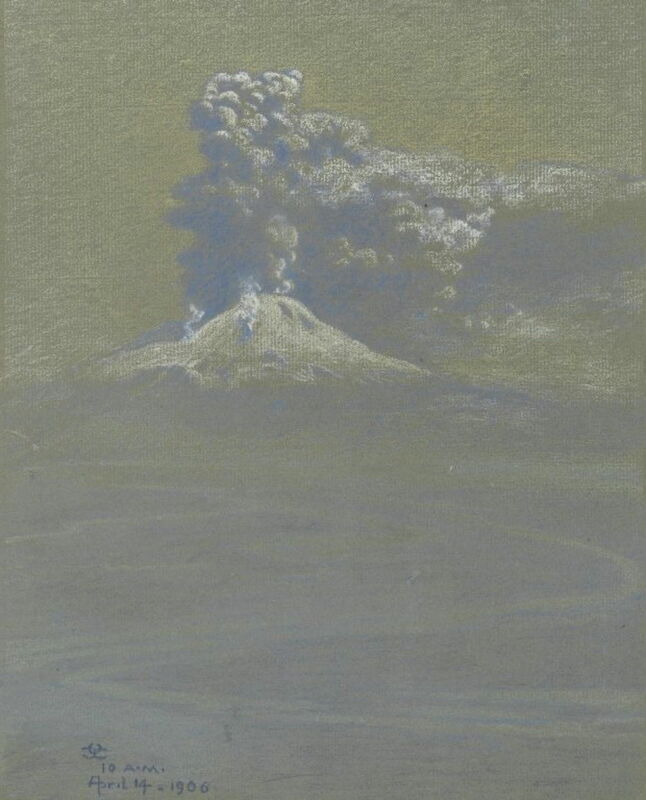 In 1906, at the start of Vesuvius’ eruption in April, he seems to have travelled to the mainland, where he painted A Shower of Ashes Upon Ottaviano (1906) in pastels. This shows the dust- and smoke-laden air of the Naples suburb Ottaviano at ten o’clock in the morning. Vesuvius is reminiscent of Japanese views of Mount Fuji, also a volcano although far less frequently active than Vesuvius. Although Ottaviano was spared anything worse than dust and smoke in 1906, it was badly damaged during an eruption in 1944. 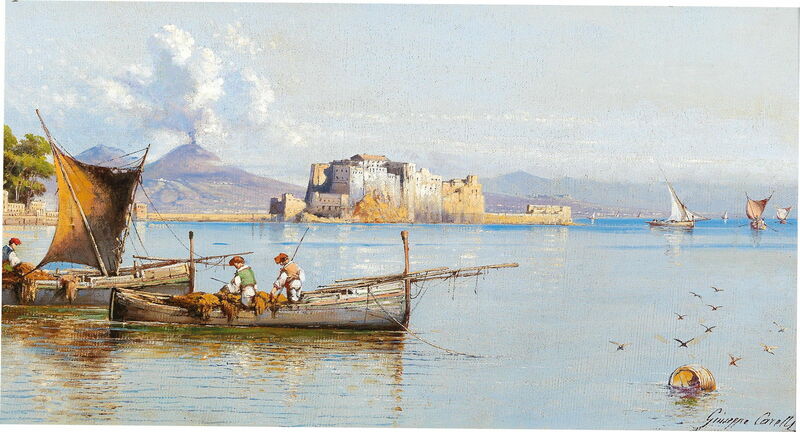 Giuseppe Carelli (1858–1921), Fishermen in the Gulf of Naples, Vesuvius in the background (date not known), oil on canvas, 25 × 47 cm, location not known. Wikimedia Commons. Giuseppe Carelli was an Italian landscape painter from Naples, who lived between 1858–1921. 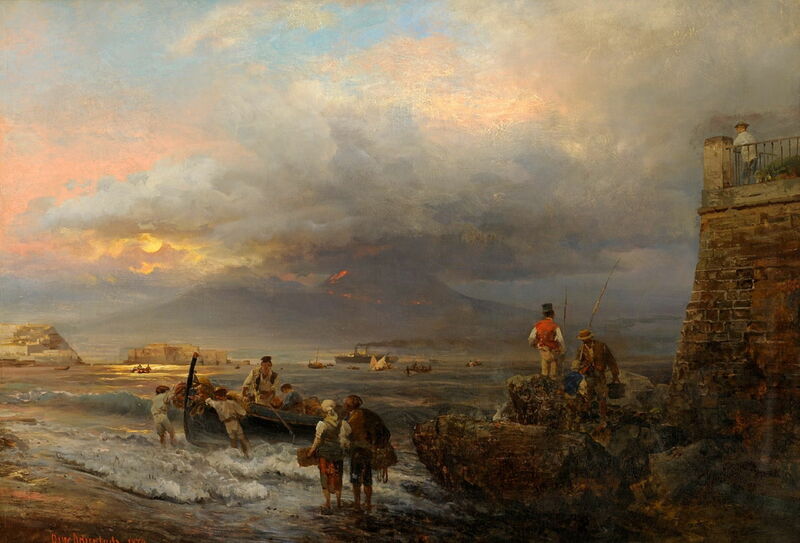 Much of his work is now forgotten, but his undated Fishermen in the Gulf of Naples, Vesuvius in the background is perhaps the final artistic statement on the volcano, now that first movies then video have replaced spectacular paintings of natural phenomena. Posted in General, Life, Painting and tagged Achenbach, Bierstadt, Bryullov, Carelli, coast, Coleman, Dahl, landscape, Martin, nocturne, painting, spectacle, Stanfield, Turner, volcano. Bookmark the permalink.